Several months ago while working on regular scheduled project, our research lab team was studying NVMe drives and software in order to find the best way of assembling software arrays. 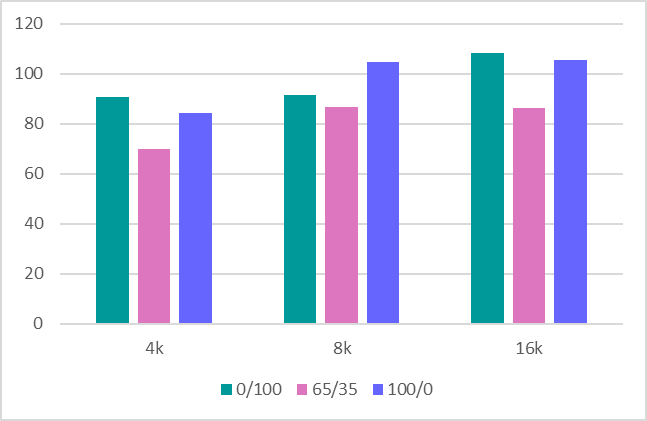 Testing results obtained that time were surprisingly confusing, as productivity of software in use was not corresponding to huge potential of NVMe drives and their speed. Our developers did not like it at all and decided to create their own solution. More than 10 companies worldwide manufacture servers and adapted for NVMe — market of products that support and develop solutions compatible with this technology is definitely of great potential. G2M analytical report provides figures convincing that this data protocol will be leading in the nearest future. 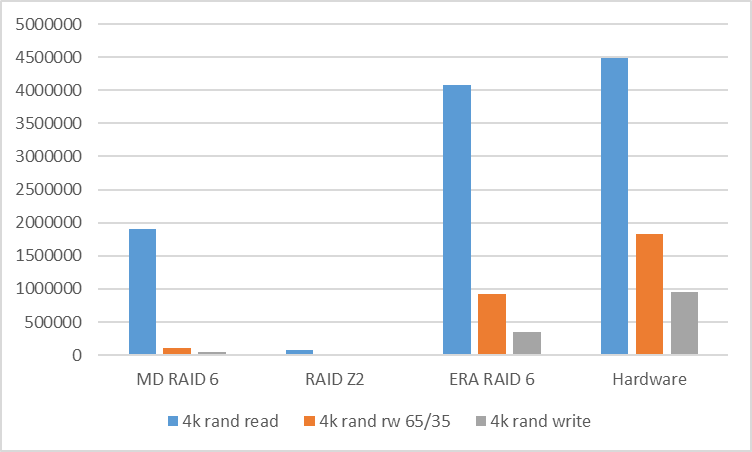 In this article will share results we got from the tests of Intel hardware and MDRAID and Zvol on ZFS RAIDZ2 software arrays comparing to our new product that was afterwards named RAIDIX ERA by our marketing team. 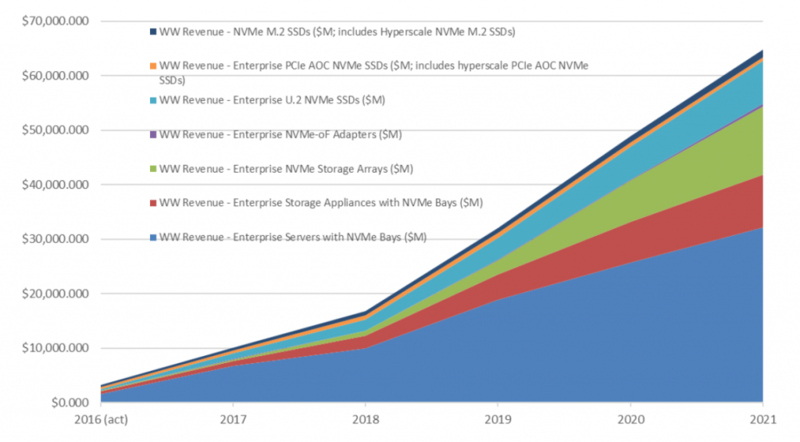 Main goal is to valuate possibilities of existing software to manage innovative NVMe hardware. The tests were arranged with assistance of Promobit company, our partner and manufacturer of servers and data storage systems under BITBLAZE trademark. Hardware platform from Intel was used as one of the leading manufacturers of NVMe compliant components. The testing was done by SNIA methodology. Intel® Server System R2224WFTZS equipped with 2 sockets for Intel Xeon Scalable processors and 12 memory channels (totaling 24 DIMMs) DDR 4 with frequency up to 2666 MHz was used as a basement. Check Intel website to get more information about the platform. All NVMe drives were connected through 3 F2U8X25S3PHS backplanes — our system had 12 NVMe drives Intel SSDPD2MD800G4 uploaded with CVEK6256004E1P0BGN. Server platform had 2 processors Intel(R) Xeon(R) Gold 6130 CPU @ 2.10GHz with enabled Hyper-Threading function allowing launch of 2 computing threads from each core. Therefore, we had 64 processing streams. All tests described in this note were performed according to SNIA SSS PTSe v 1.1 specification. 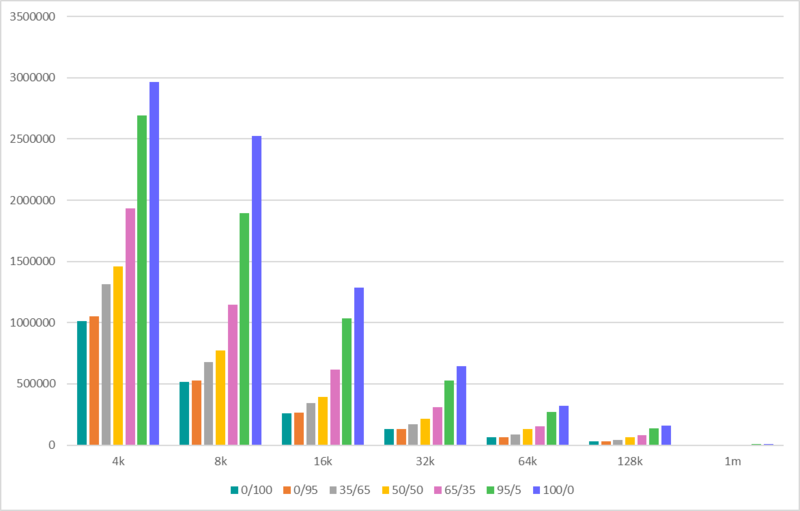 SNIA allows setting number of streams and queuing depth — that is why we set 64/32 keeping in mind that we have 64 calculating streams on 32 cores. Every test was performed 16 times in order to exclude random output. Installed the Linux kernel 4.11 over CentOS 7.4. Turned off C-STATES and P-STATES. Started utility tuned-adm and set latency-performance profile. Preparation of devices according to SNIA (dependent and independent from load type). 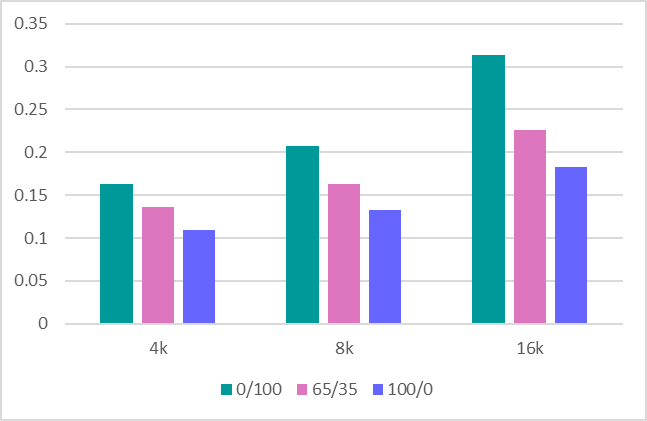 Tests for IOps blocks 4k, 8k, 16k, 32k, 64k, 128k, 1m with variations of read and write combinations 0/100, 5/95, 35/65, 50/50, 65/35, 95/5, 100/0. 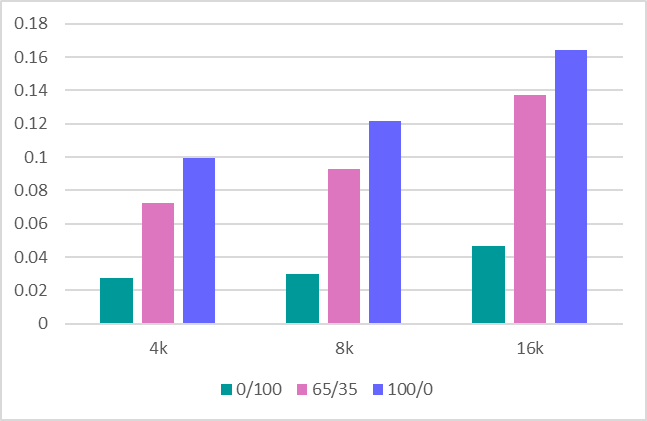 Latency tests with blocks 4k, 8k, 16k with variations of read and write combinations 0/100, 65/35 и 100/0. Number of streams and queue depth 1-1. Results were saved as average and maximum latency. Throughput test with 128k and 1M blocks, 64 in every queue 8 commands each. We have started with hardware performance, latency and throughput tests. This allowed us to evaluate potential of suggested hardware and compare capabilities of software applied. To start with, we decided to see what single NVMe Intel drive DC D3700 is capable of. 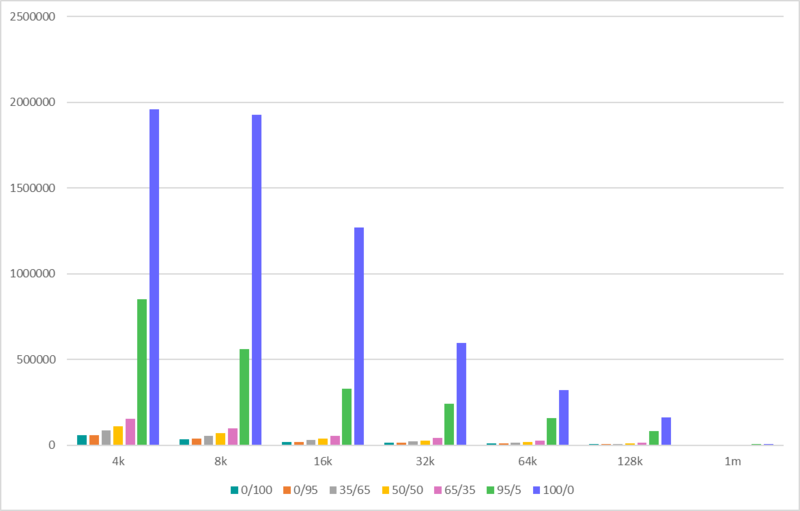 See results of IOps test in the table and diagram below. Read / Write Mix %. We got results slightly less than specified in factory papers that was most likely caused by NUMA (scheme of computer memory implementation that is used in multiprocessor systems when time of access to the memory is stipulated by its location relating to processor), but we are going to disregard it here. 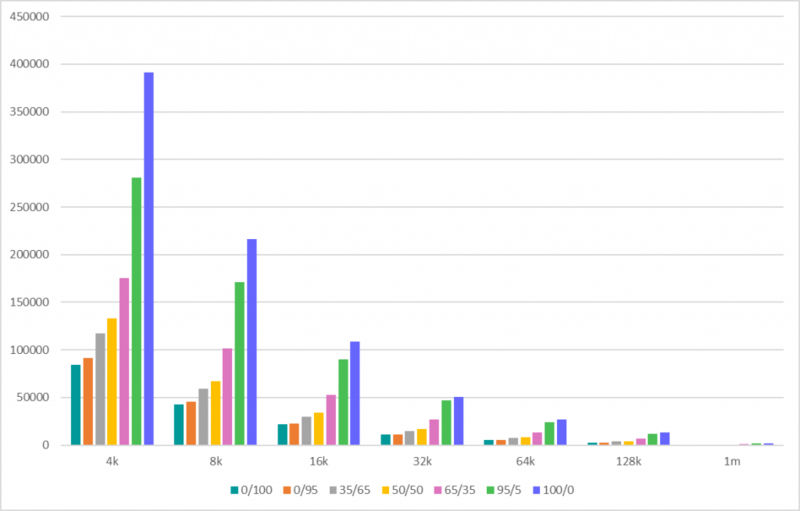 Average response time (ms). Read / Write Mix %. Maximum response time (ms). Read / Write Mix %. Got things done with one drive we moved further with evaluation of the whole platform, consisting of 12 drives. 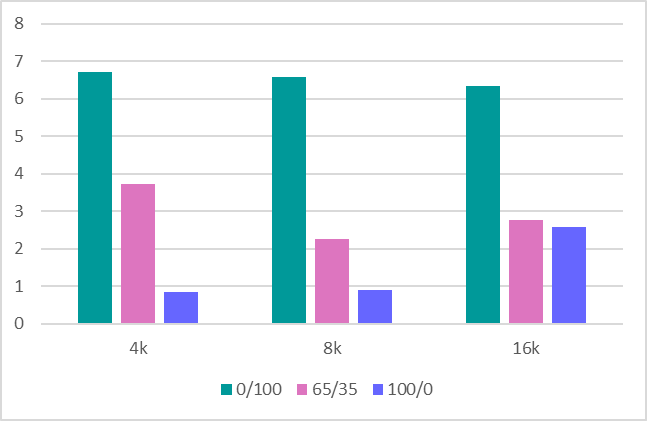 Here we have decided to save some time and show results for 4k block only (at the moment it is the mostly widespread and representative scenario of performance evaluation). 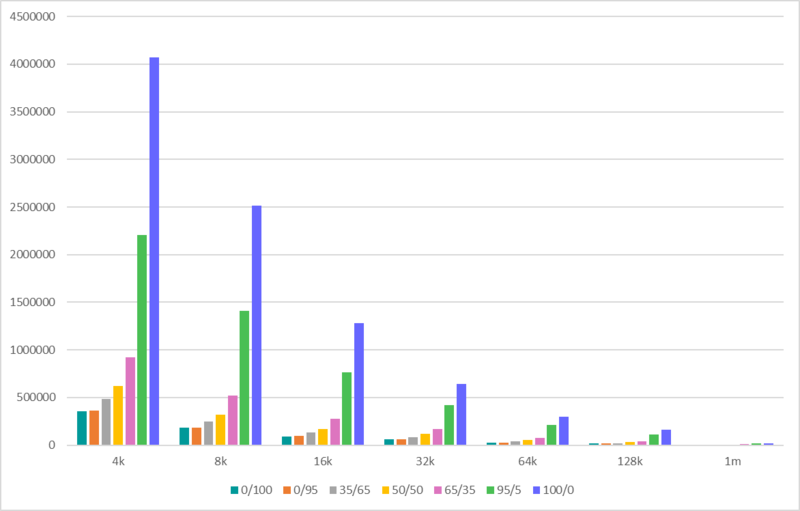 We will return to the hardware performace tests in the end of the note, comparing them to results of software tests. MDRAID is the first thing that comes up when talking about software arrays. Just remember that this is basic program RAID for Linux that is distributed for free. Let’s have a look how MDRAID works with 12 drives system of RAID 0 array level. You are absolutely right to think that RAID 0 consisting of 12 drives is a bit too much but we need this level to demonstrate maximum that we can get. Let’s have a look what the system can get at RAID 6 level. The total array capacity is 7450.87 GiB. Let’s run the test after preliminary initialization of RAID array. Worth notice that here MDRAID latency test result was quiet good. ZFS has a built-in function of RAID build and pre-installed volume manager that creates a virtual block device used by many storage vendors. We will use these features too by creating pool, protected by RAIDZ2 (similar to RAID 6), and a virtual block volume on it. ZFS showed good results with freshly created pool. 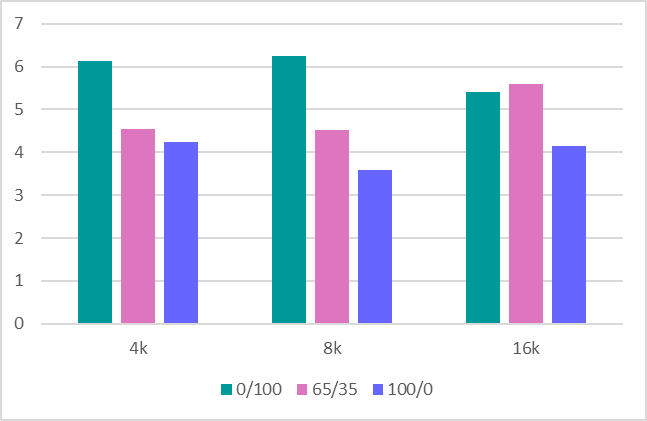 But after repeated rewrites, performance results reduced significantly. 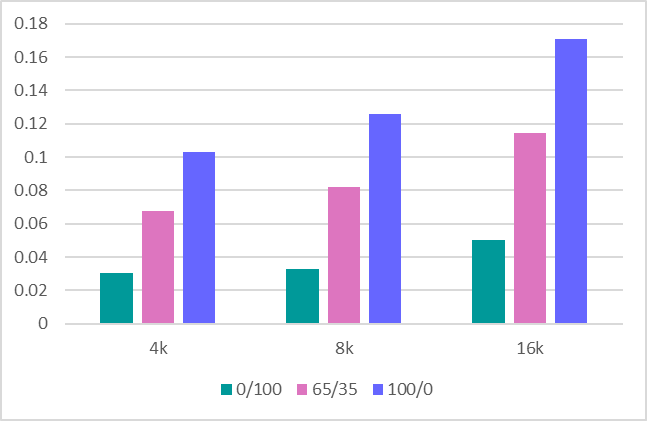 SNIA approach is good actually and allows to see real results while testing file systems of this type (which is the base of ZFS) after multiple rewrites. Performance figures obtained are quite unimpressive. The clean zvol (before rewrites) gives much better results (5-6 times higher). Here the test showed that after the first overwrite performance dropped. The maximum zvol latency were much higher than MDRAID. 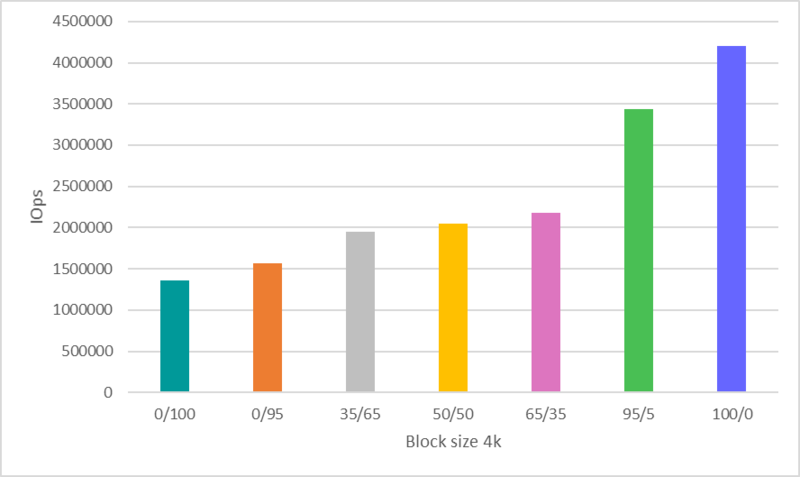 Zvol could provide higher throughput with tuned volblocksize parameter but we decided to perform all tests with single set of settings. Now let’s have a look at test of our new product — RAIDIX ERA. We created a RAID6 with 16kb stripe size and ran the test once initialization was completed. The latency is similar to what MDRAID showed. 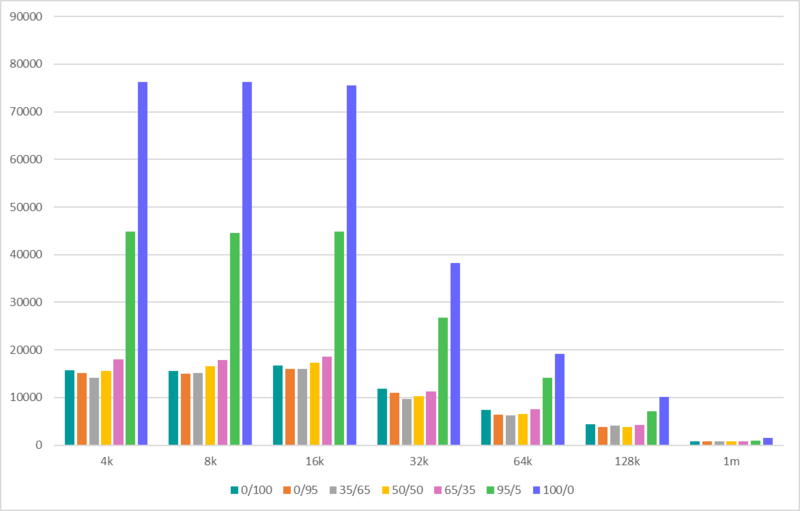 For results that were more accurate, we were to evaluate latency under more serious load. 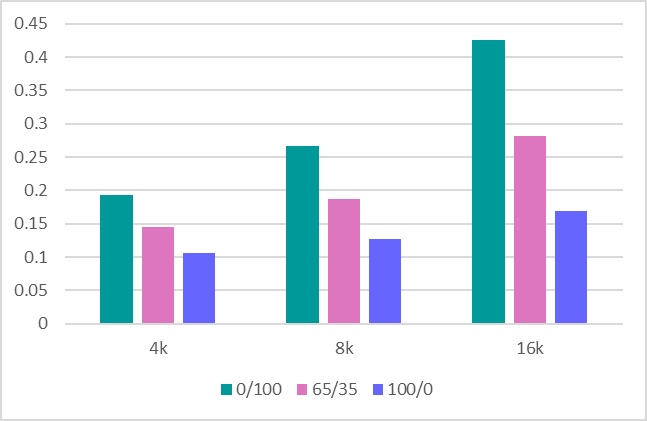 In the end let’s compare the figures from software tests with results from the hardware platform. 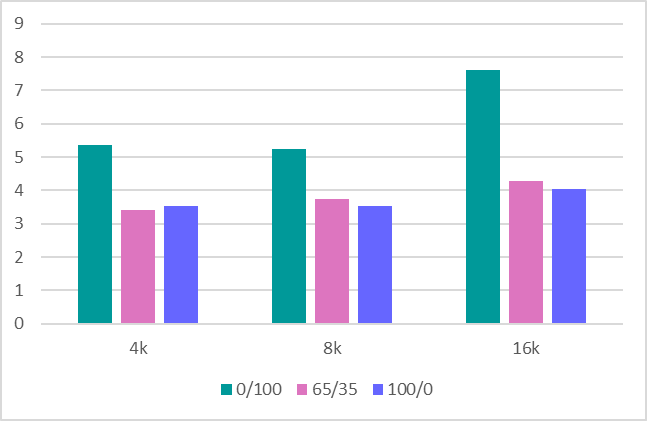 To analyze the performance of the random load, we compare RAID 6 (RAIDZ2) speed when working with 4k size. 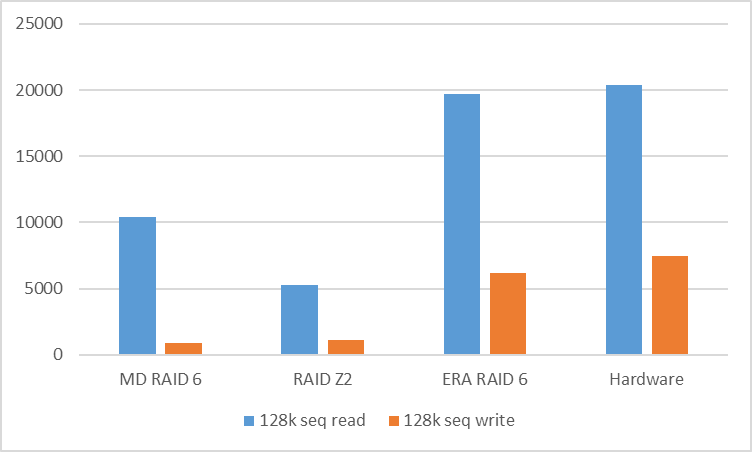 To analyze performance of sequential load, let’s have a look at RAID 6 (RAIDZ2) with 128k block IOs. 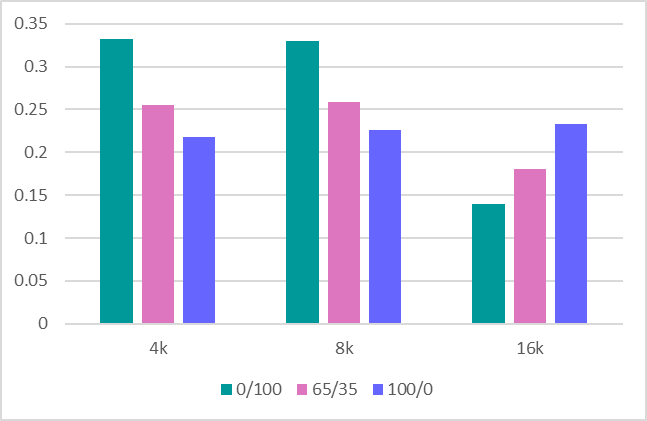 We used 10GB shift in between the streams to exclude the cache and show real performance. 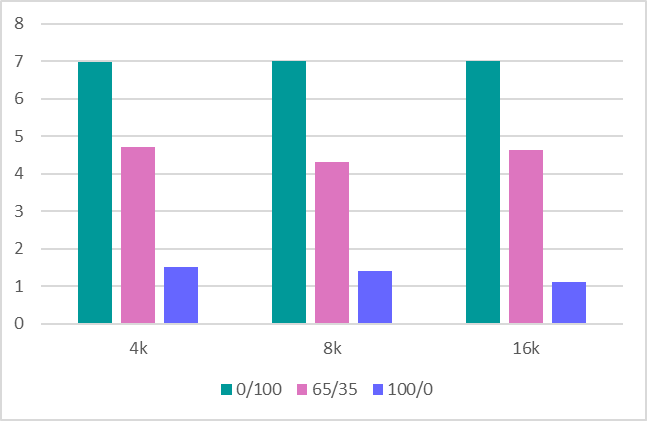 Popular and affordable software RAID arrays for NVMe devices can’t show the performance adequate to hardware potential. There is a clear need of software that can let NVMe drives be as productive and flexible as possible. At the moment we can say that these goals were met and the product is ready to use. Realizing the demand we have prepared release of free license, which rightfully can be used for both NVMe and SSD.